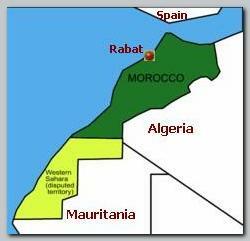 MOROCCO, a monarchy, is on the Western end of the Maghrab. MOROCCO has a population of about 32 millions people (04/2007), stretches on 459,000 km. MOROCCO also controls the Western Sahara that stretches on 266,000 km and is populated with about 350,000 Arab speaking nomads. More then 97% in MOROCCO are Muslim Sunnites, about ¾ of the population are from Berber descent and about 11 million are speaking, alongside Arabic, also dialects of Berber. MOROCCO was in the last centuries in the Western end of the Ottoman Empire as an autonomous Emirat under increasing Western influence from Spain and France. From 1912 most of MOROCCO was under French protectorate. MOROCCO is an independent country from 03/1956 after a short violent resistance against the French and the local Sultan became the first King of MOROCCO. Most of the political and economical elite in MOROCCO were alienated to the common Moroccan people. The Elite spoke French, lived in a, so to speak, Western style and were much more attached and related to France and its economy than to the Moroccan needs for education and economical developments. No wonder that in such an Islamic society the anger, frustration and demands for a greater share in the national sources by the common people got an Islamic interpretation. The true Islam, from the Islamic point of view, is about social justice as well. From the early 80s’ Islamic groups are active in MOROCCO for social justice, against the Western influence of the corrupted elite and also for an Islamic State. Some of the groups advocated violence and they became the breeding ground to extreme Islamic terror groups like the Moroccan Islamic Combat Group – (CICM). Today (05/2007) MOROCCO has a fast developing economy which eases the social and Islamic tensions in the country.